Launch services that need to use a secret API key for configuration use the Obfuscator class to decode a LaunchContolKey. The Obfuscator class accepts a LaunchControlKey, fetches the enum’s binary information and returns a string of the API key. During didFinishLaunching:, the AppDelegate creates instances of BugsnagInterface, ParseInteface, and AWSBucketHander. BugsnagInterface inherits from ErrorHandlerDelegate and implements the Bugsnag SDK for reporting errors. ParseInterface inherits from RemoteStoreController and implements the Parse SDK for accesing a remote store. AWSBucketHandler implements the BucketHandlerDelegate in order to use the proprietary network manager provided by Amazon. The LogHandlerDelegate is currently adopted by DebugLogHandler, which prints messages to the console. Once the service instances have been created during didFinishLaunching:, the AppDelegate then creates a NetworkSessionInterface, a ResourceModelController, and a LaunchController. The LaunchController is resposible for launching the LaunchService objects. The controller waits for didSucceed or didFail notifications from each required LaunchService before notifying the AppDelegate that the app has launched or failed to launch. 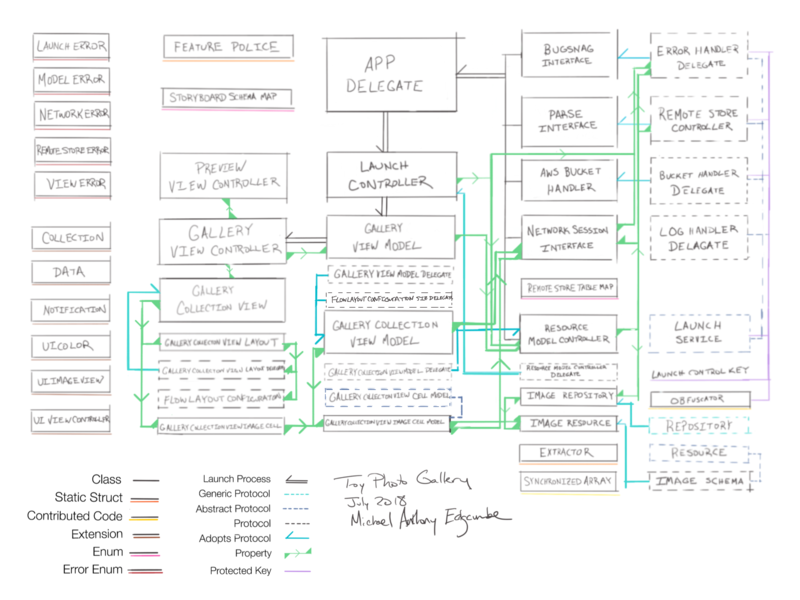 If launch is successful, the AppDelegate uses the ResourceModelController to build the foundational model’s data source. The model object in ToyPhotoGallery is represented by an inheritance from the Repository generic protocol and the Resource protocol. A Repository is a hashmap for Resource objects. The ResourceModelController holds a reference to an ImageRepository. An ImageRepository is a hash map for a collection of ImageResource. ImageResource is a type of ImageSchema, which adopts the Resource protocol. The LaunchController asks the ResourceModelController to build the ImageRepository when the LaunchService objects have signaled that they have completed configuring themselves. The ResourceModelController asks its RemoteStoreController to find a list of object with a default fetch size using a RemoteStoreTableMap. The RemoteStoreTableMap is an emum with string values that references the schema on the remote store. It provides a seam by which the remote store can be changed without affecting the resource controller. The RemoteStoreController accepts the query parameters, converts them to the proprietary Parse SDK objects, exectues the query, and returns an array of dictionaries with string keys and common object types that are retrieved from the proprietary PFObject type. If the FeaturePolice waitForImageBeforeLaunching flag is set, the ResourceModelController’s NetworkSessionInterface will attempt to fetch the thumbnail image data. for the records returned from Parse. FeaturePolice defines a list of flags that enable experimental features that are not ready for release. Once the model has been built, the ResourceModelController will call its ResourceModelControllerDelegate to indicate that the model update has succeeded or failed. During launch, the delegate points to the LaunchController, which then signals to the AppDelegate that the app is ready to move forward. In return, the AppDelegate asks the. LaunchController to push an instance of GalleryViewController onto the stack. The RootViewController is created by the app during launch after the window’s UINavigationController has pushed through the launch screen. The LaunchController completes a launch by creating a GalleryViewModel with its ResourceModelController, and then assigning the model to a GalleryViewController instance created from the Main storyboard. When the app pushes to the GalleryViewController, launch is complete. When a GalleryViewModel is assigned to a GalleryViewController, the view controller refreshes layout with a new instance of a GalleryCollectionViewLayout configured with a FlowLayoutConfiguration that is set up for a vertically scrolling GalleryCollectionView. The GalleryViewController uses its own GalleryViewModel to create a GalleryCollectionViewModel that is responsible for providing the data to the collection view. The GalleryCollectionViewModel assigns itself as the GalleryViewModelDelegate, which provides size information and allows the collection view model to inform the view model that the index paths have been updated in the data source. The GalleryCollectionViewModel assigns the GalleryViewModel’s ResourceModelController as its GalleryCollectionViewModelDelegate, so that it can request paged assets from the resource manager directly. The GalleryCollectionViewModel uses a SynchronizedArray for thread safe access to an array of GalleryCollectionViewImageCellModel, the indiviudal data model for each GalleryCollectionViewImageCell in the collection view. The GalleryCollectionViewImageCellModel adheres to the GalleryCollectionViewCellModel protocol so that the GalleryCollectionViewModel could be extended with different types of cell content and the GalleryCollectionView can be agnostic to the types of cells it is displaying. As the user scrolls through the GalleryCollectionView, the GalleryCollectionViewModel checks if new data is required. If so, the model sends a request to the GalleryCollectionViewModelDelegate, which is adopted by the ResourceModelController. The model controller handles the fetch through its RemoteStoreController, extracts the ImageResources into its own ImageRepository, and then hands the new records back to teh GalleryCollectionViewModel so that it can insert the items into its own data source of a GalleryCollectionViewCellModel array. When the update cycle completes, the GalleryCollectionViewModel informs the GalleryCollectionView, acting as the GalleryViewModelDelegate,that it needs to process new IndexPaths and refresh the cells. Each GalleryCollectionViewImageCell is responsible for checking the ImageResource model it received from the GalleryCollectionViewModel for an embedded UIImage. If either images for the ImageResource model’s thumbnail or full-size views is nil, the cell is responsible for fetching the image data. In retrospect, this is not a great design pattern because of the cell’s lifespan. The cell is often not in view when the asynchronous calls to return data received. This functionality should be moved out into the model controller. Since the GalleryCollectionViewLayout is the collection view’s UICollectionViewFlowLayoutDelegate, the GalleryCollectionView is set to be the GalleryCollectionViewLayoutDelegate, which is the channel by which the signal is sent to show a PreviewViewController as a child of the GalleryViewController and switch the scroll direction of the collection view to horizontal. The GalleryCollectionViewModel delivers sizing information to the layout class acting in the role of a FlowLayoutConfigurationSizeDelegate. When the signal is sent to change modes in the GalleryCollectionView from gallery to preview or vice-versa, a new collection view is created via the process above and placed into the view hierarchy. CoreAnimation transactions are used in combination with the UIView convenience methods for animation to swap out the views.